If you are one of the lucky ones to be able to snag PlayNora’s Zombie Street off the App Store while its price has dropped from $2.99 to $0.99 then you are set for a great bargain. Zombie Street definitely plays like a $2.99 iPhone game with upgrades, hordes of zombies, and an interesting and simple story. 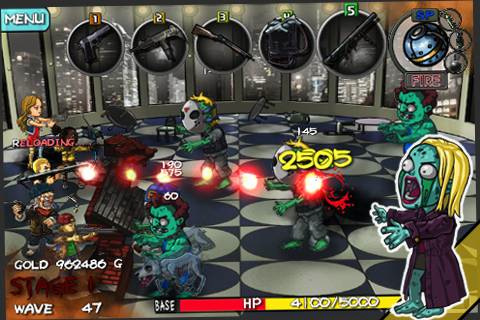 The objective of Zombie Street is to defend yourself in each level from hordes of zombies until they are all wiped out. You stay deployed in a small corner and have to shoot and kill approaching zombies. As you progress through each level, you earn currency which can be used to upgrade the area you are defending, along with purchasing better weapons, barricades, stat upgrades, and allies. The game is very simple once you have purchased all your allies. In easy mode, it basically plays by itself once all the allies are purchased. My favorite part was purchasing and using the different types of weapons along with my own little army. The game runs very smoothly considering all the units on screen at once. Not only was this game easy to play, but the color was like drugs to the eyes. Zombie Street is a very colorful game, and when I say colorful, I don’t mean the red shooting out of every zombies head. With nicely animated backgrounds, and dare I say it, mentally challenged looking zombies, what more can you ask for? There were just a few things that could have been done that would have made this game perfect. There are a few sprite errors when you character is attacking along with how PlayNora decided to allow you to replay the game. There isn’t a level select. Replaying the game means playing from the first level again however you keep all your upgrades that you were allowed to have at that point. Finally, you are only allowed one save file which was a bit depressing. Zombie Street is an awesome steal for 99 cents, and not bad of a price for $2.99 either. If you’re a zombie shooter fan, $2.99 isn’t all that bad for me judging by how much fun I had, but if it’s still 99 cents, you better jump the gun. 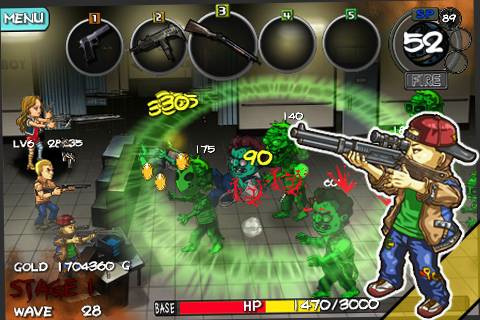 AppSafari review of Zombie Street was written by Vincent Tam on March 10th, 2011 and categorized under Action, App Store, Arcade, Games. Page viewed 6783 times, 1 so far today. Need help on using these apps? Please read the Help Page. this game is very short level.